In recent decades, there has been a proliferation of studies that illuminate the connections between gender, environmental change, and livelihoods in Asia and Latin America. Much of the work in this vein has sought to show how an understanding of gender inequality and its impact is crucial for making sense of the pressures on natural resource-based livelihoods in the context of globalisation and resource conflicts of various kinds. 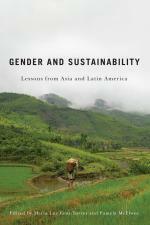 Whilst this book might be seen as another contribution to this already rich field, it is in fact an invitation to place knowledge about gender and livelihoods squarely into recent debates about sustainability, and to take seriously the social and economic dimensions of sustainable development. Although this may seem to echo the rallying cries that underpinned efforts to include women’s concerns in international agreements around sustainable development back in the 1980s and early 1990s, a key difference is in the way the authors eschew externally driven ‘development’ as a central organising theme, and instead look to the everyday struggles of local people to secure livelihoods in the context of resource access, use, and exploitation. It is in these everyday struggles - particularly those of women and others who are often marginalised from marketised development - where the possibilities for sustainable futures might be observed. Paying close attention to these hidden spaces of livelihood sustainability is important, not only for bringing the often neglected role of women into view, but, as the final chapter notes, also for identifying ‘how women’s strategies are critical in defining local adaptations to outside pressures’ (p. 237). The book opens with a useful chapter that sets out the concepts and theoretical approaches that underpin subsequent empirical chapters. These are grouped into sections that deal with particular natural resources - forests, water, and fisheries – in which different dimensions of gender and sustainability are revealed. Chapters on forests deal largely with the expanding roles of women, either as environmental activism expands women’s political space (e.g. chapters by Linda D’Amico and Neera Singh on Ecuador and India, respectively), or as the commodification of nature leads women into new roles. As Pamela McElwee notes in her chapter on the illegal trade in wildlife in Vietnam, these are not just questions about production, but also concern gender roles in consumption. Water is one realm in which it has been relatively easy to demonstrate why gender matters: in this section of the book, contributors reveal the importance of women’s strategies in creating pathways for sustainability (Amber Wutich on Bolivia, Stephanie Buechler on Mexico, and Georgina Drew on India), in each case using a gender analysis to rework the concept of sustainability to demonstrate the significance of its social and cultural dimensions. Chapters on fisheries (Hong Anh Vu on Vietnam, James Eder on the Philippines, and María Cruz-Torres on Mexico) put paid to the oft-held idea that fishing is men’s business and, by focusing on fish processing and trading, show the importance of women’s social networks, entrepreneurialism, and activism for understanding sustainability in the context of marketisation, environmental degradation, and conservation policies. As is common in edited collections of this kind, the contributing authors do not adhere to a single analytical position, but instead develop their discussions through an engagement with their ethnographic material, sharing a concern to turn an anthropological lens on how, within the lived experience of gender relations, women and men meet and respond to the drivers of environmental and livelihood change. A final chapter, by Lisa Gezon, draws together the various threads of the book, and makes a persuasive case for taking an anthropology-led case-study approach to research, for focusing such case studies on women (contextualised through rural/urban divides, ethnic identities, alternative sexualities, etc. ), and for developing a better understanding of the factors that foster both women’s agency and environmental sustainability. Quite apart from its importance for those working in the field of gender, environment, and development, this is a book that deserves to be read carefully by those engaging in recent iterations of sustainability science. The book provides plenty of evidence that shows the need to enrich and complicate ecological and economic conceptualisations of sustainability by attending to its myriad socio-cultural dimensions and how these play out in particular contexts. However, there is a danger that a careless engagement with this book could lead readers to revisit the conclusion that women are the key to achieving sustainability: a view which has been criticised for naturalising women’s environmental caretaker roles and for identifying women as a target group for fostering sustainable livelihoods. Within the current global political-economic scene, both of these framings have been shown to result in further gender injustices rather than bringing empowerment or better environments. A useful addition to the book would be some reflection on the dilemmas of championing women’s apparently sustainable livelihood practices and strategies without challenging neoliberal development agendas. There are important political and ethical questions that the book opens up for future discussion and this book helps open up space for further debate and analysis.